a little bit bunny: the north pole is that way ! the north pole is that way ! Now I know why there are so many photos of penguins apparently pointing to something! Beautifully simple, simply beautiful! I love the staging and interplay of character sizes... If penguins and polar bears coexisted this is how they'd interact for sure! I think you're right, if I ever turn this into a real screen print I'll change it. I did try the back right leg as white, and it looked wrong, I think pale blue would work. Cheers for the constructive criticism, it's always welcome. I made the changes anyway, what the hell! I moved his back leg back a bit which seemed to make it less obvious. I also took the opportunity to change the title from 'It's that way!' to 'The north pole is that way!' to make the joke a little less esoteric. 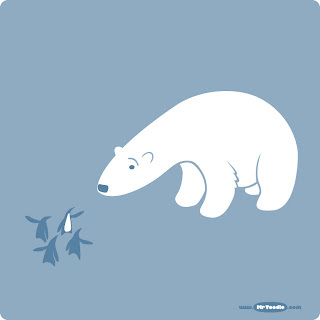 I love the idea that the Penguins are teasing the Polar Bear, giving him conflicting advice! Really great work again!